State Boat #2 docked at Alexander's Mill (background building) at Lock 37 on the Ohio Erie Canal in 1890. 1825 was a big year for Ohio. On July 4, 1825 in St. Clairsville, opposite the old courthouse, groundbreaking ceremonies were being held for construction of the National Road in Ohio. On the very same day, just south of Newark at Licking Summit, groundbreaking for the Ohio & Erie Canal began. Two weeks later at Middletown ground breaking was held for the Ohio & Miami Canal. At the same time work began on the Ohio & Erie Canal from Portage Summit (Akron) to Cleveland. On July 3, 1827, two years after the ground breaking, Governor Trimble and the canal commission boarded a canal boat in Akron and the next day arrived in Cleveland. By 1832 the entire 308 mile route of the Ohio-Erie was open to traffic. The Ohio & Erie Canal would go underneath the National Road at Hebron Ohio. A small section of the original lock marks the location where Governor DeWitt Clinton of New York and Ohio Gov. Jeremiah Morrow, turned the first shovel of earth, marking the beginning of construction of the Ohio & Erie Canal on July 4, 1825. 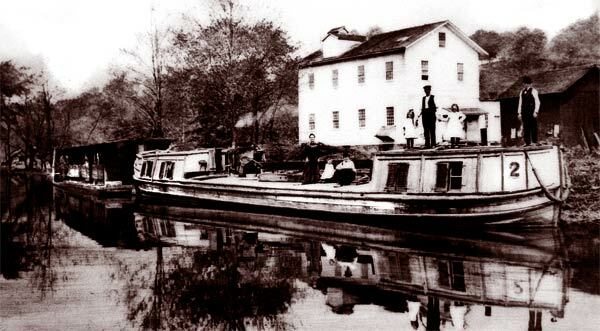 The first "canal boat" to travel the Licking County section of the canal was built at Hebron and launched on July 4, 1828. Unfortunately, the boat only got as far north as Four Mile Lock, because the boat was built too large to pass through the lock, so it had to return to Hebron, where it became a saloon and later a house of ill repute. Part of the canal still can be seen near the Hebron Fish Hatchery. This area is available for fishing and canoeing. This ground-breaking site and marker is located on SR79 south of Heath. The Works Museum in Newark hopes to find part of Lock No. 9 this spring (2008), when it intends to excavate a building it owns on First Street in downtown Newark. The canal once flowed between Canal and Market streets, where The Works parking lot now stands. While the concept of the Erie Canal was fostered by George Washington, the Ohio canals owe their beginnings to Alfred Kelley who championed the cause of building a canal system in Ohio so that crops from the rich Ohio farmlands could be delivered to areas outside of Ohio. Along with Governor's Brown Morrow, Kelley helped survey the possible routes the canal could take. "I am now very busy in making out maps and plans for our canal lines... constant confinement leaning over a tables gives me a little of the headache... but I think this will wear off as I become accustomed to it... None of the other canal commissioners have yet arrived. I think we shall hardly be able to report by the 15th Dec... but we may be." Two months after that, the Ohio legislature created a Board of Canal Commissioners with the power to locate the route and start construction of 2 main canals: one from the Ohio River to Cleveland, and the other from Cincinnati to Toledo. The canals were dug using basic hand tools and lots of manpower. 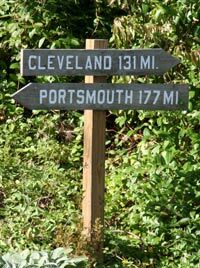 The Cleveland to Akron connection was built between 1825 and 1827 with a complete route to Portsmouth completed by 1832. Through a series of locks, which raised and lowered the water level, canal boats traveled the entire state in days, rather than weeks, and allowed for the rich natural resources in Ohio to reach the rest of the world. Many of the original locks today are difficult to imagine how they operated, and only vestiges of their original purposes. There are however, several restored locks where you can get a good idea of the process. Each lock is numbered (1,2,3...). The numbers begin at Summit Lake in Akron. This marks the high point of the Ohio & Erie Canal. From this geological area rivers north of this point flow north to Lake Erie, and rivers south of this line, flow to the Ohio River. The lock numbering begins here. Lock #1 North is between Exchange Street and Cedar Street in Akron just a few blocks east from the University of Akron Campus. Lock #1 (Wolf Creek Lock) South is south of Akron in the town of Barberton (which did not exist when the canal was first built) just north of Snyder Avenue. At the same time the main Ohio & Erie Canal channel was being built, feeder canals were also being built that would link with the main canal system. The construction of the canal was overseen by the Canal Fund Commission which handed out contracts to private contractors that bid on half mile sections of the canal. This allowed much faster development of the entire system. To help pay for the construction, the Ohio government borrowed the money from bankers and east coast businessmen. It was estimated at the time, that the Ohio & Erie Canal would cost $2.3 million, and the Miami & Erie would be $2.9 million. However, when all the bills were added up, the total cost for both would be $41 million, with more than 1/2 of that going to pay the interest on the loans ($25 million). 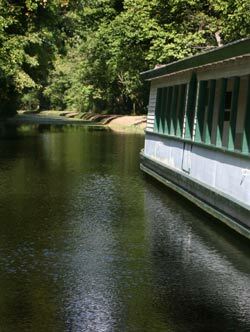 The minimum dimensions of the canal had to be at least 40' wide at the water level and 26' wide at the bottom with a minimum 4' of water. These dimensions were generally exceeded with most sections being 60' - 150' wide and 5' - 12' above the waterline. The towpath had to be at least 10' wide. The standard lock of stone and timber construction was 90' long and 15' wide with walls 5' thick at the top and 4' at the bottom. There was usually a 6 to 12 feet rise per lock. Locking-through would be taken care of by two crews—the boat crew and the lock crew. Canal boats were usually maintained by their owners. The canals themselves posed other difficulties. Maintenance was an ongoing problem for the canal system. Keeping the canals weed free during the summer months required frequent cutting. Retaining walls also suffered from heavy rains or poor construction and required frequent repairs. The Canal Commission leased the canal to private operators for a several years, but most operators failed to make needed repairs to their sections of the canal. The state decided to take over the maintenance and created maintenance crews and boats that traveled the canal taking care of repairs, but this was almost a losing effort before it even got started. Canal boats had no on-board power source to move them along. That required mule teams to pull the canal boat either up-stream or down stream. The mule team would usually be led by several young boys, taking turns prodding stubborn mules along the tow path for about $20 a month. Work shifts were 5 - 6 hours, with the boys changing when the mules were changed. A canal boat would keep 2 sets of animals. While they weren't leading the canal boat, the resting pair would stay on board the canal boat in the middle compartment that was set up as a small barn to house the animals. Mules were used primarily for cargo loads, but there were some canal boats that were used expressly for passenger service. These canal boats had a little nicer accoutrements, and, they were usually pulled by teams of horses. Because of their small size, load capacity, they would move faster. In time, it was discovered that these faster canal boats had to have speed limits applied to them to help reduce the soil erosion caused by their wake. Even before the National Road, the Ohio & Erie Canal, and the Miami & Erie Canal were finished, they had already become obsolete with the introduction of railroads that would soon crisscross the state, delivering goods and people faster and to more destinations, cheaper. The National Road would see a comeback, but Ohio's Canals would never be the transportation highways they once were, but now, almost 200 years later, they are seeing a resurgence in interest as tourist destinations, hiking trails, and bike paths that stretch across the state. 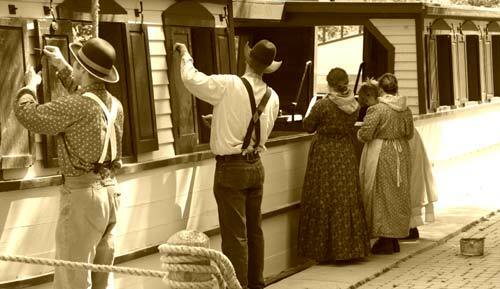 Today visitors can experience the Ohio & Erie Canalway along three major paths. The Ohio & Erie Canalway Byway allows motors to cover almost the entire length of the scenic canalway in their automobile or motorcycle. There are plenty of stops along the way to get out and experience the many museums, scenic points, and places of interest along the canalway. You can also experience the area riding on the Cuyahoga Valley Scenic Railroad that snakes through the valley along side the canal. Taking the train, you'll experience the fun and adventure, the romance and nostalgia of riding the train on one of the oldest, longest, and most scenic excursion railways in the country. Choose from a variety of different excursions and special events available throughout the year. Days, departure times, and fares will vary. You can also experience the area by bicycle and walking. Miles of paved pathways make this one of the most extensive bike paths in the country on the Ohio & Erie Canal Towpath Trail. There is a spiral bound travelers guide book available that is highly recommended even for motorist's that covers the entire length of the Ohio & Erie Canal Towpath Trail. This is an ideal guide that gives you not only helpful maps of each 14 mile section, but also points of interest and brief descriptions of areas. It costs about $15.00 and is well worth the price. Don't leave home without it. It's about 4-1/4" x 9" and only 1/4" thick so you can easily pack it in. Locks enabled canal boats to rise and lower with the terrain. As a canal boat moved upstream it required someway of rising in elevation. This was accomplished by dividing up areas along the way into sections. Each section had a lock at each end. These were called lift-locks. 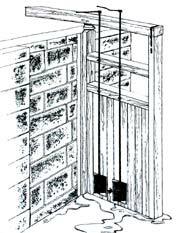 A lift-lock had swinging gates at each end of the chamber. The chambers were constructed usually out of limestone, a common type of stone found in Ohio that was relatively easy to shape. By releasing and admitting water into the chamber, the lock was capable of lifting and lowering boats about 8'. The locks were hand operated and filled or drain of water by opening or closing wicket gates at the bottom of the lock gate. By cranking these gates by hand, it allowed water to enter or exit the lock. The building was constructed as the house for the Lockkeeper of the Canal, who collected the tolls and kept records of commerce on the canal. At each lock along the canal there would be someone responsible for operating the lock's gates, and for collecting tolls. The lock keeper would be on call 24 hours a day. Some of the locks were named after a prominent lock keeper, a nearby town or important geographical feature. Some locks are known by more than one name and some are only known by their number. Just 2 years after the groundbreaking the first boat, "the State of Ohio" carried Governor Trimble and others the 38 miles from Portage Summit near Akron to Cleveland.